INTEGRAL is a large and heavy observatory, but in financial terms it is only a medium-sized mission of ESA's science programme, costing about half as much as the large cornerstone missions. This cost saving is feasible because the gamma-ray observatory employs much of the same spacecraft engineering as ESA's X-ray satellite XMM-Newton. Scientists and engineers could therefore concentrate development efforts on areas specific to INTEGRAL. The spacecraft is made up of a service module and a payload module. The service module provides the housekeeping equipment, that is, power generation, conditioning and control, stabilisation and ground-satellite link, while the payload module hosts the instruments. The interface between the two modules was designed to be as simple as possible. This approach allowed working in parallel on the service and payload modules, thereby reducing the time needed for developing, assembling, and testing the spacecraft. The service module of the INTEGRAL spacecraft is a rebuild of that developed for the XMM-Newton project. The requirements of the two missions in terms of orbit, power, data rates, and pointing are very similar, which makes the rebuild logical. Scientists kept modifications required to accommodate INTEGRAL specific needs to a minimum, thereby reducing development risk and financial envelope. Electric power is generated by a deployable, double-wing solar array. Two nickel-cadmium batteries store the energy. Spacecraft control comes from hydrazine thrusters. For INTEGRAL, the original XMM-Newton tanks had to be replaced by diaphragm tanks. Instead of an internal device, these tanks contain a diaphragm separating the liquid propellant from the pressurisation gas. This was necessary because the Proton launcher and the INTEGRAL satellite needed to be integrated and transported in a horizontal orientation, not vertically as XMM-Newton was on Ariane-5. To connect the service module with the Russian launcher, scientists designed a special adapter that also includes the separation system. The INTEGRAL payload module consists of an equipment platform accommodating the detector assemblies and an empty box supporting the 'upper floor' at a height of about 4 metres. The coded masks, a key feature of INTEGRAL's instruments, are installed in this area. The backbone supporting the instruments in the payload module is an H-shaped structure. It is made of strong and stiff composite material and ensures that the instruments have the structural stability necessary for their accurate pointing. 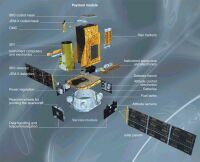 The INTEGRAL payload consists of two primary instruments: SPI (Spectrometer on INTEGRAL) and IBIS (Imager on Board the INTEGRAL Satellite). Each of them has both spectral and angular resolution, but they are optimised differently in order to complement each other and to achieve an excellent overall performance. These instruments are supported by two monitor instruments, which provide complementary observations at X-ray and optical energy bands: JEM-X (Joint European X-Ray Monitor) and OMC (Optical Monitoring Camera). The Spectrometer, Imager and JEM-X share a common principle of operation: they are all coded-mask telescopes. The coded-mask technique allows imaging of the high-energy sky and is all-important in separating and locating sources. It also provides near-perfect background subtraction because, for any particular source direction, the detector pixels are considered to be split into two intermingled subsets, those capable of viewing the source and those for which the flux is blocked by opaque mask elements. Effectively the latter subset provides an exactly contemporaneous background measurement for the former, made under identical conditions. The layout of the payload module has been conceived in terms of a separate science-payload module containing the instruments. These were integrated and tested independently and later incorporated into the spacecraft as a single unit. The interface to the satellite bus was designed to be as simple as possible to reduce complexity, time scales and cost. A particle radiation monitor measures charged particles fluxes of the spacecraft orbital environment, helping to assess the background and thereby the sensitivity and performance of the instruments.